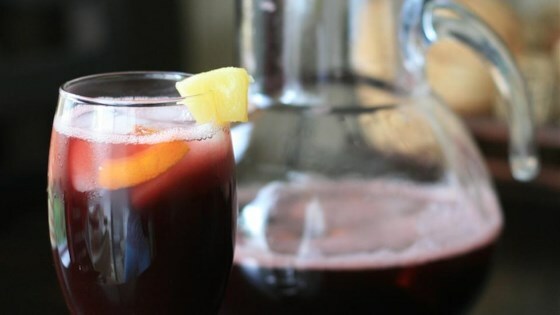 "This is a sassy red wine punch that has tropical fruit floating in it. May be served with ice if desired. " In a large punch bowl combine red wine, sugar and pineapple juice. Mix in the pineapple chunks, orange slices and lime slices. Serve chilled. I made this for a girls' night party, and loved it! It was a bit strong, but we added some diet Sprite and that helped dilute it. I will definitely make this again. Really simple to make and delicious. Highly recommended!